Two types of pictures that were guaranteed to hold my attention as a child were cross sections and cutaways. These revealing illustrations offered readers a god-like omniscience allowing them to peek at things that were usually hidden and imparting an understanding of how individual parts or spaces fitted together to form a more complex whole. If you’re not clear on what the difference is, a cross section is a drawing which shows the view revealed by an imaginary straight line slice through an object, while a cutaway is a drawing in which some external parts have been removed (or ‘cut away’) to reveal the interior. 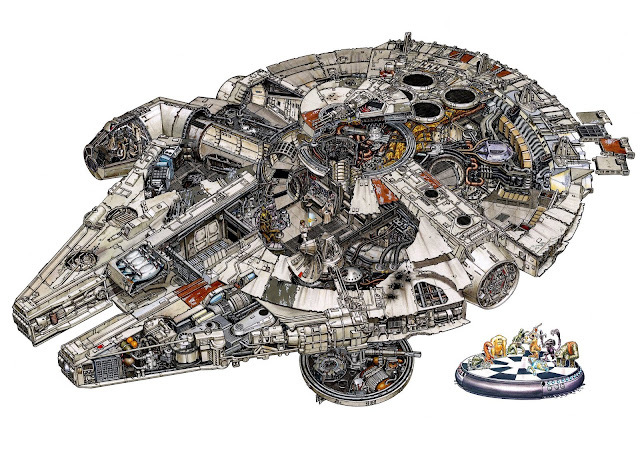 Many of the drawings featured in “cross section” books are actually cutaways. One illustrator who did a great deal to popularise cutaways was Leslie Ashwell Wood. 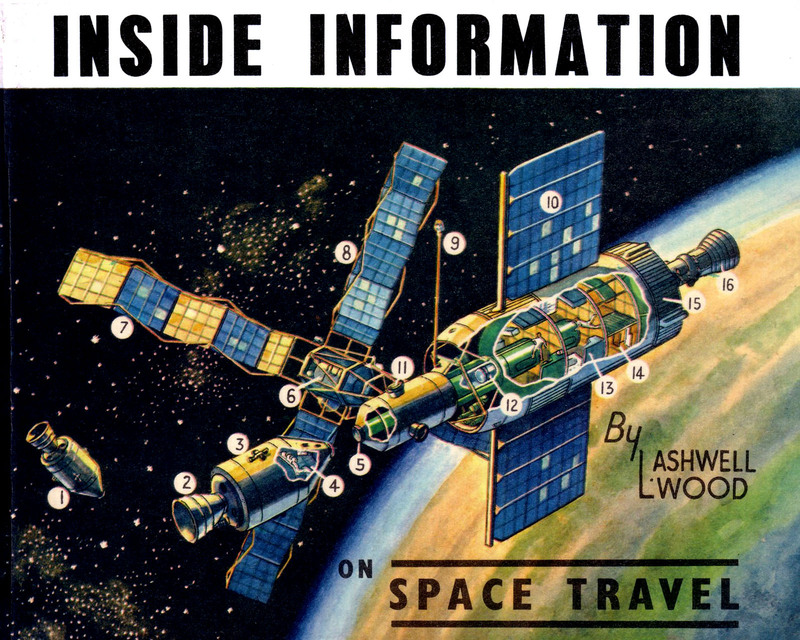 Although perhaps best know for the hundreds of cutaways he created for the Eagle comic in the 1950s and 60s, Wood also produced a series of Inside Information books including this one featuring cutaways of space craft, which I spent many hours poring over as a child. 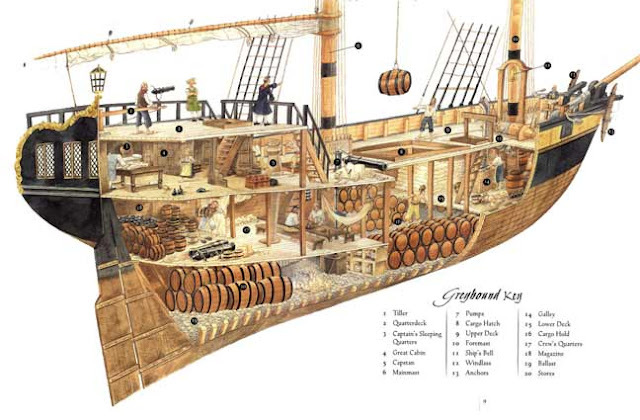 There was a quite a craze for cross sections and cutaway books in the 1990s*, perhaps most notably the Incredible Cross Section series illustrated by Stephen Biesty. 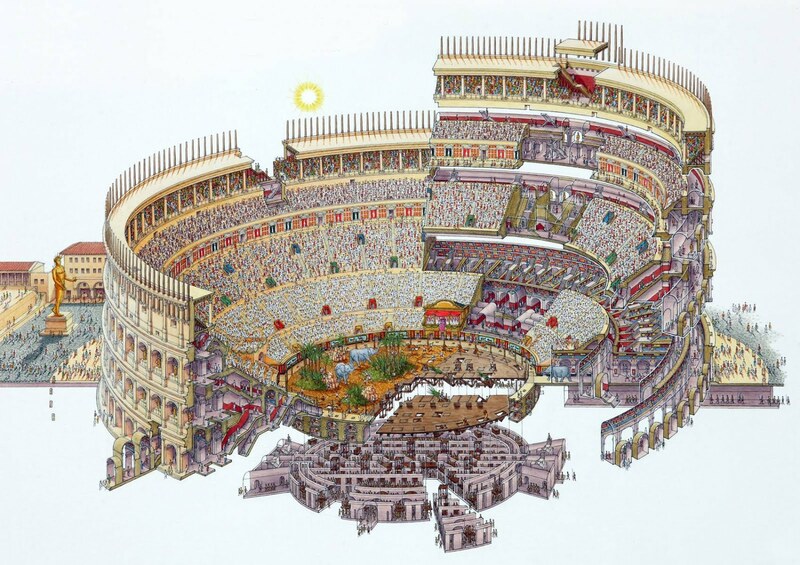 Rome in Spectacular Cross-Section with text by Andrew Solway. While Biesty’s drawings revealed the hidden intricacies of the real world, past and present, other illustrators began to produce equally detailed cross sections and cutaways based on the fictional worlds of films and TV shows. In 1998 Dorling Kindersley published Star Wars: Incredible Cross-Sections, illustrated by Hans Jensen and Richard Chasemore and written by David West Reynolds. Hans Jenssen’s Millennium Falcon cutaway from Star Wars: Incredible Cross-Sections. Since then everything from the Thunderbirds' rescue craft to Wallace and Gromit’s motorbike and sidecar has been laid bare in cutaway or cross section form. An amusing variation on the genre is Alan Snow’s How Things Really Work series which purports to show the mechanical interior workings of familiar creatures. A cross section though a Stegosaurus from Alan Snow’s How Dinosuars Really Work. 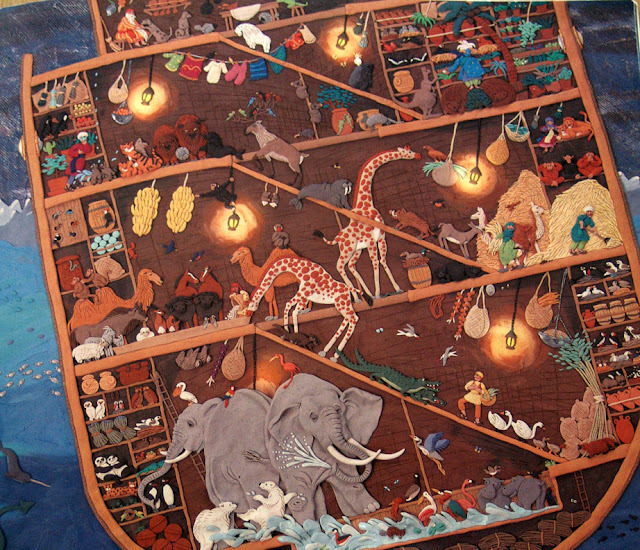 Although some of the books featured above contain fictional content, none of them are story books, so I thought I’d finish off by looking at some picture books that incorporate cross-sections and cutaways into a narrative. Now that you know what a fan I am, you probably won’t be surprised to learn that cross sections and cutaways occasionally pop up in the picture books I've written, such as this wonderfully detailed crocodile-submarine gatefold that Steve Cox created for The Treasure of Captain Claw. Captain Claw's crocodile-like submarine (click here to see a larger version). … as does this Noah’s Ark cross section (made from plasticine!) 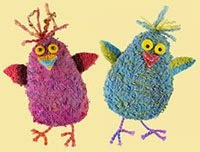 by Barbara Reid for her picture book Two By Two. … to this by the end. I hope you've enjoyed this 'slice' of some of my favourite picture book cross sections and cutaways. If you have any favourites of your own, I’d love to hear about them in the comments box below. * Fellow Picture Book Den author Moira Butterfield wrote the text for several of them! 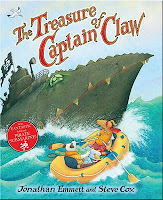 The submarine cross section featured above is taken from The Treasure of Captain Claw, by Jonathan Emmett and Steve Cox and published by Orchard Books. Yup, I wrote a few! I used to get given the DK machine ones and my engineer Dad and uncle used to help me. We were a great writing team! The artists used to get paid really well, and rightly so. The cross-sections were lots of work but now those non-fiction budgets have sadly disappeared. I love cross-sections/cutaways in picture books though. Such a lot to pore over. How satisfying! Full Moon looks fantastic. I think lots of children love sitting poring over detail. I know I was one of those children. I loved intricate doll's houses and those funny busy pictures at the beginning and end of Beano Annuals. Glad to hear the illustrators were well paid. Some of those DK illustrations must have taken weeks to do. It's funny that you mention dolls houses. I've been exchanging tweets about cross sections on twitter and had just said that their appeal is very similar to dolls houses. Really interesting post, Jonathan! Cross-sections are fascinating - you disappear into them, wanting to see every little nook. I need to check out the Full Moon books. Delicious. Books with illustrations this detailed offer so much value. Years of fun! Great -I've spent hours poring over such books with my children, especially ones where you're looking into someone's house or shop... Thanks. It was reminiscent of the Where's Wally type of book, but more beautifully drawn (in my opinion). It was similar in some ways to David Macauley's Way Things Work book, in that it had little people inside large structures. It was not a search book exactly, more like a maze book. It had lot's of tiny people, but inside machines and little factories. I remember one chapter had a red space station where asteroids were carved into stars (carved rocks painted yellow..). Another chapter was of a bobble hat factory. Another was a cake factory. Some paths led to dead ends, or dud cakes/stars/bobble hats etc. The artwork was lovingly drawn with all sorts of things going on around, and yet calmer than similar book. It felt like it must have been from the mid-90s. Can any of you remember it at all? Wah,it was a fantastic book. I can picture the artwork, but I have been Google-image searching, looking around amazon, and Pinteresting with no luck.